I showed the new self-adhesive Poppy stamps when they arrived just before the issue date 23 October. 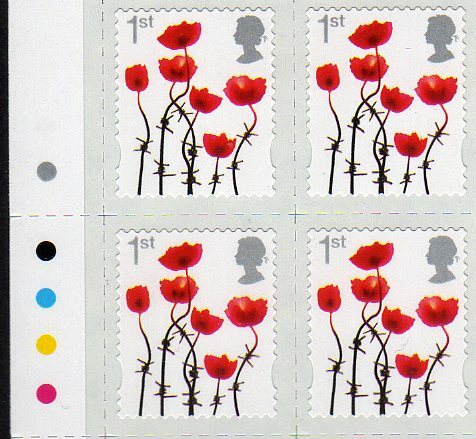 I went to the main town Post office and asked for the Poppy stamps with the pictures from you web site. The counter staff hadn’t heard of them and they certainly had none in stock. The staff happened to question a young lady who was walking about (appeared to be a member of staff) and she categorically told me that they don’t have these stamps as they are only issued in a Post & Go machine!! So I went to a second office (remember they should know something about stamps as they were one of the potential Sunday openings for the Olympic issues). They were reasonable in listening to my request but was told that they don’t have them and they had not heard of them. So off I went to a third office, in Hertfordshire. A nice large quiet office and very friendly staff. They hadn’t heard of the stamps but ensured nothing had been received and missed. I then tried another main office in Essex. Over the years it a bit hit and miss – sometimes really excellent but other times a disaster. Today, the most arrogant and officious person I’ve ever dealt with. She had the poppy stamps but said she didn’t think she should be selling them (I noted part of the sheet had already been sold). I pointed to the printing in the margin “Sale Date 23-Oct-2012” and her arrogant reply – “that’s nothing to do with it – I haven’t been told that I can sell them”. She shrugged and she said “I’m just getting on with it”. I then enquired about the Christmas Madonna & Child and to ensure she knew what I was talking about I showed her pictures of the stamps. Strange reply – “We don’t have them, the only ones I know about are these …” pointing to the picture from page 40 of The Philatelic Bulletin (showing the 2011 1st class) . That’s odd as a) that Christmas stamp is the earlier issue coming off sale on the 8th November and b) just above that picture are details and issue date of the poppy stamps. My local post office branch still doesn't have any, so I decided to phone Post Office customer services on 0845 722 3344. After a couple of menu options I was answered surprisingly quickly (quicker than Royal Mail CS usually are!). I said I was enquiring about stamps, and said, "Every year you issue a Lest We Forget Poppy stamp but this year's doesn't seem to be available". The immediate response was "Not every year." So that lady got off to a bad start. I told her that contradicting me was a bad start, and explained that not only had they been issued every year but that this year's was a new stamp, and that Post Office had told me on twitter that "They should be available at all branches." Our exchange continued, including her assertion that it was Royal Mail on twitter, but I explained that Post Office were there as well. My call to the Customer Helpline has now been logged as a complaint to PO Customer Services, and I should get an answer within 10 working days. Let's see how widespread this problem is - have you seen any in your local post offices? As these have started appearing on eBay it seems appropriate to say that the Royal Mail product code is AS841 - although they weren't on the RM shop website last time I looked, that's the code if you are ordering! See also comments received so far. It would be useful to know whether those offices satisfy the above criteria? Wide spread problems with Post office branches are nothing new. I have visited several PO s in the last few weeks with inquiries about philatelic items. I can only recommend one in the Birmingham area, the Northfield branch, staff were very helpful in so much as they directected me a private window which is normally used to issue currency. In total (ON AND OFF)I was at window for nearly three hours. God bless you young lady for your patience and help. I just wish all PO would take a leaf out of your book. No problem in Strood Kent Post Office. I didn't want a quantity, (only 5) but it looked as though I could have had a sheet or more. What a shame that your reporter had so many problems with his Post Offices regarding the Poppy and the Christmas stamps. I don't why some of the staff are like this as there is no need to be. My main Crown office here in West Sussex are so helpful and often go out of their way to help by phoning their help line to find out things for me regarding new issues etc. This works both ways as I also help them with questions from other collectors which they can't answer. With regards to the Poppy stamps they had these about a week before the issue date and on the 23rd I was able to buy exactly what I wanted with no problem at all. All their Christmas stock is in and has been for some weeks now. Again next week I will be able to go in and know they will have most of what I want. Not sure about cylinder numbers on the Christmas books though. Nothing new there, my post office still don't have self adhesive low value stamps released 2011. Doncaster Main Office (Priory Place) had the Poppy stamps when I called in today. No problem at Macclesfield on 23 Oct, once I asked, they produced approx 10 sheets (500 stamps)I bought 5 stamps and made FDcs. Although, when asked about the Madonna & Child stamps, was advised that they were Christmas stamps and not available until 6 Nov - even after showing them this blog. However, they still do not have any of the 6 x 1st class Diamond Jubilee books scheduled for 1 Oct but issued on 16 Oct.
We had that in the original post, when updated on 5 October. Sorry, we can't put the same thing in multiple posts - always good to follow the links back to early comments and updates. They really don't know how to run a philatelic service that collectors want. Mind you, they didn't even tell dealers about this one: first notice was in September's Philatelic Bulletin! I asked for the new 1st class Poppy stamps, but none at my local Post Office in Liverpool, "Not being produced this year" they said. I'll try the main Crown Office. Now on RM website though, in sheets of 50. A bit poor that a new stamp is not available to buy from all Post Offices!